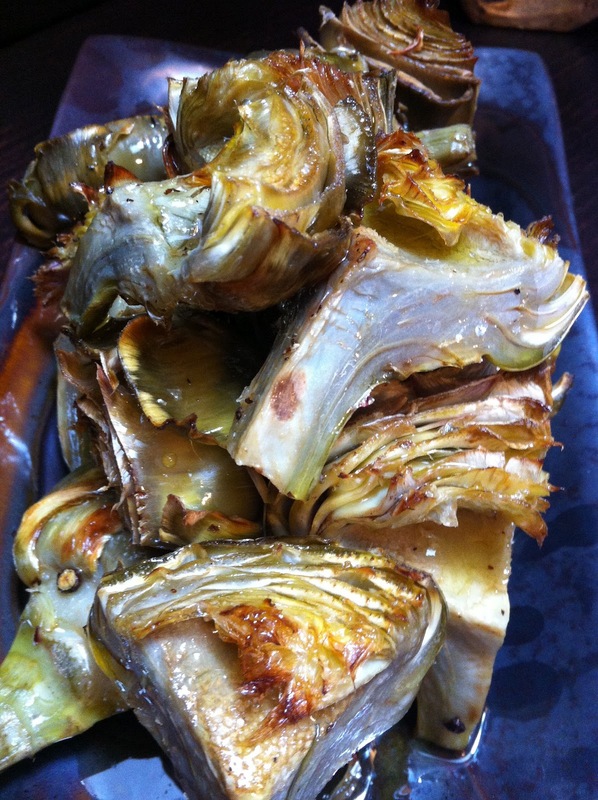 incredibly fed blog: We Heart Artichoke Hearts! We love artichokes and always try to make up a couple of jars whenever we are in Barcelona as a useful standby. They are a great accompaniment to the meatier tapas dishes. Artichokes are much cheaper and more available there as after Italy Spain is the biggest European producer so you can also rest assured they have not clocked up too many food miles. Originally thought to be from North Africa where they are found in the wild they take their name from the Arabic Al-khurchuf. Used in Southern Europe since Greek and Roman times when their medicinal qualities were recognised they are nowadays a strong contender for the acolade "super food". They are great antioxidants, strengthen liver, bile and gall bladder functions, reduce cholesterol levels and aid beneficial gut bacteria. Here in London artichokes made their debut on the market stalls a few weeks ago and will continue their run for some time yet. Preparation takes a few minutes but is straight forward enough so it is probably worth doing a few at the same time and storing them. Before you start have a bowl of water with a few drops of either lemon juice or vinegar added to stop oxidation and a large waste bag for the discarded leaves and stalks. We generally begin by cutting off the the top (Probably about 1 - 2 cms from the stem, you may find a serrated knife best for this) and removing the woody leaves until the softer greener leaves are revealed. Quarter the artichoke, then scoop out the central hairy "choke" with a teaspoon. Depending on the age and size we generally leave about a half centimetre of the stalk attached. Place in the acid water as quickly as possible. When you have them all prepared blanch them in salted boiling water for about 3 to 4 minutes then place on a baking tray with a little olive oil and seasoning and put in a hot oven for a further 7 or 8 minutes or until soft when prodded with a knife. 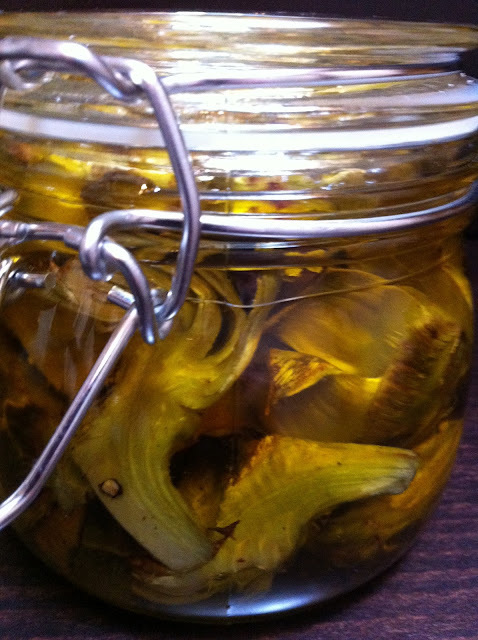 Allow to cool and place in a preserving jar and cover with olive oil. They will keep for several days. Alternatively you can brush the raw artichoke pieces with oil and place on a hot grill until slightly charred. This method is best for young to middle sized artichokes but for larger artichokes where the leaves have become woody remove the stem entirely and boil whole in salted water for about 15 - 20 minutes. Then serve standing in a soup bowl with a melted butter or vinaigrette dip. Diners can remove each leaf and scrape out the flesh with their teeth before removing the hairy choke with a knife and eating the fleshy base.